In terms of continuity, some of the current activity on the web – like blogs and personal web sites – was anticipated in the 1980s by the so-called “zine movement”. As photocopy machines became widely available, a number of people began to realize that they could self-publish inexpensively. In the aftermath of Punk Culture, there were many small, cheaply made magazines, or “zines”. 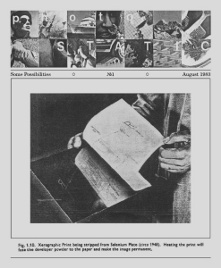 One “zine” was PhotoStatic Magazine that began publishing in Iowa City in 1983. At its high point, PhotoStatic had 750 subscribers from around the world. Zine participants were frequently criticized for letting their enthusiasm for expressing themselves outweigh the critical content of their publications, a criticism often levelled at contemporary bloggers. (2) The creation and publication of zines was eventually subsumed by the internet in the early 1990s. Not surprisingly, the digital revolution has also profoundly affected the cinema, but there, too, it is possible to see continuity. One could say, for instance, that digital cameras themselves are the realization of Alexandre Astruc’s famous call in 1948 for a “caméra-stylo”, a camera that could be wielded as easily as a pen and could easily film everyday life. Although digital is not appropriate for all cinematographic projects – for instance, the French director of photography Eric Gautier recently reported that it would have been impossible to have used digital on Sean Penn’s Into the Wild (2008) (7); similarly, the Belgian filmmakers Jean-Pierre and Luc Dardenne, although having experimented initially with digital cameras, for their latest film ultimately decided that Le Silence de Lorna (2008) required 35mm. (8) Nevertheless, since the onset of the third millennium, filmmakers from around the world have increasingly been shooting digitally to make their films. For instance, the Dogme filmmakers, who renewed and extended the original goals of the French New Wave, make shooting digitally part of their manifesto. Instead of looking at Dogme films, however, this paper proposes a discussion of four very different films shot digitally, to try to come to a better understanding of the uses of digital in film. In fact, Michael Mann’s penchant for neo-film noir makes him a natural convert to digital. For his second film shot digitally, Mann and Beebe again used the Thompson Viper, but, instead of the soft, wraparound style of Collateral, they sought hard contrasts. (10) Based on one of the most popular and innovative television series from the 1980s, which Mann produced (11), Miami Vice (2006) abandons the sunshine and pastel colours of its forerunner, and the film anchors itself firmly in the chiaroscuro of the 21st century. With the help of the most advanced technologies, Sonny Crockett (Colin Farrell) and Ricardo Tubbs (Jamie Foxx), two FBI agents, go undercover to expose an international drug cartel. The film has been criticized for its patchwork aspect and dizzying pace. But the critic Cyril Neyrat reminds us that Mann’s film succeeds in drawing the “portrait in high definition of a world rendered incoherent, illegible, and decorative by the explosion of digital technologies” (12). The foregrounding of new technologies is heightened and paralleled by the emphasis on speed: racing cars, supersonic jets and ultra-fast speedboats transport the protagonists all over Latin America, merging them with the surrounding landscape. Visually, Mann sought a “maximum chromatic saturation” (13), possible thanks to the extreme sensitivity of digital to variations in light. The budget for Michael Mann’s Miami Vice skyrocketed to 200 million dollars, in part because Mann chose to shoot on location, where his sets were besieged by three different hurricanes. While increasing the challenges for his film crew, these real locations give his film an additional verisimilitude. Despite its narrative confusion, which Neyrat argues is a by-product of Mann’s wager to play with HD, Miami Vice was a blockbuster d’auteur. Shijie (The World, 2005) is his fifth film and his first to have been shot with the permission of the Chinese authorities. The story of the film – young people who have left the provinces for Beijing – is perfectly illustrated in an opening shot: a peasant traverses the landscape of the theme park outside of the capital, where the film is set. In China, there is even an adjective used to refer to those emigrating to Beijing; they are called “floating” (16). Unable to obtain visas to leave China, these young people rarely leave the park, which is filled with smaller replicas of the major world monuments and whose advertising jingle is: “Visit the world, without leaving Beijing.” It is well known that globalization cancels distance between places and here the Taj Mahal is adjacent to the Acropolis, which is near the Eiffel Tower, which is near the pyramids. One day, the girls dress up in Indian costume, and, on another, they participate in an Egyptian extravaganza. After a day at work, Tao (Zhao Tao) tells her boyfriend she feels like “a phantom”. Since his earlier film, Zhantai (Platform, 2000), mostly filmed in long-shot, Jia Zhang ke has moved his camera closer to his characters, whom he films with an unusual balance of objectivity and understanding. Shot in high-definition digital, The World offers both a critique of globalization’s promises, epitomized in another ad – “We hope that this magnificent panorama will contribute to your knowledge of the world” – as well as an exposé of the concomitant breakdown in human relations amongst his contemporaries. Like Michael Mann’s Miami Vice, The World is similarly characterized by a visual heterogeneity. With the use of HD, Jia Zhang ke explores here three distinct visual registers. The first is reserved for the spectacle scenes, often in loud colours, and filmed in long-shot, where the girls perform on stage, accompanied by techno music. HD also captures the more muted, sombre colours of the private lives of these displaced young persons, filmed in medium-shot; Tao doesn’t seem to have a place of her own and, when she is not with her boyfriend, Taisheng (Chen Taisheng), she sleeps in cheap hotel rooms, void of any personal effects. In the next clip, Tao has just left her boyfriend after an argument. On the bus, she receives a text message from him. This animation scene is then followed by one of the spectacle scenes with the girls on stage. Communication is in fact at the very heart of The World, and these twenty- and thirtysomethings communicate often by cell phone and text messaging. When a jealous boyfriend, who has been unable to reach his girlfriend on her cell, tells her that she must never turn it off, because he must be able to reach her at any moment of the day, one of her friends tells him he should buy the new Motorola, capable of operating anywhere in the world. Ironically, despite or perhaps because of the omnipresence of electronic gadgets here, Jia Zhang ke’s film illustrates that such hyper-communication does not necessarily produce better communication, and is inevitably accompanied with various losses. The villagers working on a construction site in the capital, for instance, limit themselves to speaking standard Chinese, not their local dialect. As for the standard language, it is reduced to clichés. At a party, a wealthy Chinese man tries to pick up Tao, telling her that he’s seen her before in his dreams, and she understands that the banality of his language is a verbal expression of the empty world in which she lives. Like the Karaoke performed by another Chinese businessman, “the world” inhabited by these young people is all simulacra. Interestingly, in the course of the film, Tao undergoes a metamorphosis: initially, she is strong-willed and able to defend herself against her boyfriend’s machismo, but, subjected to the ongoing unreality of the Park, she begins to experience anomie and longs for some stability and wants to get married. When Tao tells her boyfriend he must never cheat on her, he responds, “Today you can trust nobody. You can have confidence only in yourself”, thus indirectly signalling his own betrayal of her. If Mann uses the digital as a metaphor for the chaos of our contemporary world and Jia uses it to make a critique of it, then Kiarostami uses the digital to bring us closer to people and everyday life. In his approach, he is the direct heir of the Italian Neo-Realists and, like his Italian forbears, he uses a mix of professional and non-professional actors. In Ten, we watch a driver and her six passengers over ten scenes. Despite its careful preparation, Ten is an example of absolute minimal filmmaking. The mise en scène employs two static cameras, two lenses and the barest of décors: the front seat of a car, plus the clothes and accessories of the people in the car. In the film, a young, attractive Iranian woman drives various passengers, five women and one male child, around the city of Teheran. The woman, Mania Akbari, an Iranian artist, plays herself: that of a mother whose young son reproaches her for having divorced. In the film’s ten episodes, the son appears four times and a friend twice. Despite the contemporary setting, no cell phones here interrupt the flow of dialogue between the female chauffeur and her passengers, and, other than a passing reference to satellite television, the digital revolution is absent here. Instead, the mise en scène is confined to the front seat of a car. Kiarostami has said he is particularly fond of cars, because they provide an enclosed space for conversations difficult to have elsewhere. The result is a moving inquiry on human relationships and on the status of women in Iran. Kiarostami’s favourite episode is the opening scene between the woman and her young son lasting 17 minutes; it is particularly gripping, if not shocking, as we enter into the mælstrom of a heated, domestic argument. As in The World, the female lead here undergoes a subtle transformation: by the end of the film, she has given up custody of her son to her ex-husband, but, despite this loss, she seems to have achieved a hard-won serenity. Some filmmakers like George Lucas have predicted that digital cinematography will revolutionize filmmaking, by dramatically lowering costs. Despite his age, the French filmmaker Eric Rohmer (b. 1920) is one who early on embraced shooting digitally, but not, as one might initially think, to lower costs. In fact, his first film shot digitally, L’Anglaise et le duc (The Lady and the Duke, 2001), cost 6 million Euro, about US$8.5 millions, four times more than his normal film budget because of the new technology. The Lady and the Duke is Rohmer’s twenty-third film and third historical film, based on the memoirs of an English aristocrat, Grace Elliott, who lived in France during the French Revolution. Rohmer first discovered her book and had the idea to make his film during the bicentenary celebration of the French Revolution in 1989. His conception of the film was inspired by the developing technology of video superimposition and he waited a decade for it to be perfected in order to shoot his film. Faced with the challenge of recreating the late 18th century, he had several options. He could have shot his film in real settings, as he did in his Die Marquise von O… (1976), using the few buildings that remain from the period in Paris, carefully filming them to avoid inclusion of satellite antennæ, etc. But this approach would have meant there could be no establishing shots to orient the viewer. The second approach would have been to shoot in studio, recreating the period as the filmmaker did in his Perceval le Gallois (1978). For the interiors, Rohmer reconstructed real sets, because the sets affected the movement of the actors. Finally, he did a “kinescopage” – that is, a transfer of the digital video to 35mm film. Ultimately, his creation seems, as one critic aptly described it, “not only vivid and credible but stamped with an exquisite grace, in harmony with the period” (26). Released in 2001, Rohmer’s film was one of the first French films shot digitally and his innovative use of the new technology was widely applauded. His point of view, on the other hand, was for many scandalous – one review was entitled “Faut-il raccourcir Rohmer?” (“Should Rohmer’s head be chopped off?”) (29) – and it is thought that the film was not included at the Cannes Film Festival on account of its conservative outlook. Grace Elliott, on whose book the film is based, came to France in 1786 as the mistress of the Le duc d’Orléans, the cousin of Louis XVI. The film opens in 1790, when their affair is already over, but they remain friends, despite their different political positions. Grace (Lucy Russell) is a Royalist, sympathetic to the king and a supporter of the English system of a constitutional monarchy; the position of Le duc (Jean-Claude Dreyfus) is more ambiguous and, out of expediency, he casts his vote in favour of guillotining the king. What is completely new and even revolutionary in Rohmer’s position is the sympathy he arouses for the doomed aristocracy, in adopting the viewpoint of the Englishwoman, as in the scene where Grace is presented with the head of a princess, skewered on a stick. What’s still overlooked in French history books is how incredibly violent this period was. Eschewing both the grandiose lyricism of Abel Gance’s Napoléon (1927) and the bonhomie of Jean Renoir’s La Marseillaise (1938), Rohmer chooses instead to suggest the extreme violence of the French Revolution and to depict the French populace in an often unfavourable light. Rohmer’s view is hardly the dominant one and it’s worth noting that two left-wing intellectuals have recently published tracts in praise of Maximilien Robespierre. Slavoj Zizek has just edited a volume of Robespierre’s best speeches with an introduction, where Zizek wonders how to “reinvent a liberating terror” (30). Robespierre is also an important reference for the French theorist Alain Badiou in his De quoi Sarkozy est-il le nom?. Over a career now spanning fifty years, Rohmer has distinguished himself as an ethnographer of a certain bourgeois, contemporary France. If, as François-Guillaume Lorrain points out, Rohmer’s film is “ideologically contestable”, it is nonetheless completely faithful to his overall œuvre. (31) Still, it is perhaps Jean-Michel Frodon who has best understood the film’s radicality: “Rohmer’s enemy is neither [Jean-Paul] Marat nor Robespierre but tele-reality shows, which is to say a system of representation, based on the illusion of a total equivalence of images and affects.” (32) Rohmer’s film roused a strong critical reaction in France, but it’s worth remembering that far fewer people have seen his version of the French Revolution than Sofia Coppola’s five years later, and which was shot more conventionally on 35mm. The new digital technology has allowed these four very different filmmakers to tell stories differently. The fact that three out of four of these films ran counter to their country’s ideologies seems to be a direct result of the new technology. Although Jia Zhang ke’s film was shot with the permission of the Chinese authorities, it is clear that they are keeping close tabs on him. Kiarostami’s film has yet to be shown in his own country and Rohmer’s was not chosen for France’s national film festival. Is it possible that digital also allows for women’s stories to be told more easily? A survey of four films is too small to draw any definitive conclusions; nevertheless, three of these four films centre on women: Mania Akbari in Kiarostami’s Ten, Tao in Jia Zhang ke’s The World and Grace Elliott in Rohmer’s The Lady and the Duke. For Kiarostami, in particular, having a female as the pivot of a film is completely new and he attributes this development to the ease of working with the new technology. Will in the coming decades digital completely replace 35mm film? Today that seems inevitable and, fortunately, the new technology is stimulating some of the very best filmmakers and directors of photography working today. As for the larger consequences of the digital revolution, we’ll just have to wait and see. Unless otherwise noted, translations from the French are by the author. Jay David Bolter and Richard Grusin, Remediation: Understanding New Media (Cambridge, Mass., and London: MIT Press, 2000). See Lloyd Dunn’s article, “PhotoStatic Magazine and the Rise of the Casual Publisher”, forthcoming in Kembrew MacLeod and Rudolf Kuenzli (Eds), Cutting Across Media: Appropriation and Interventionist Collage. Robert Solé, “Penser le cité numérique”, Le Monde des livres, 18 January 2008, p. 6. “Penser Wikipedia comme un project, pas encyclopédie” [“Wikipedia Should be Thought of as a Project, not as an Encyclopædia”], interview with Olivier Ertzscheid by Astrid Giradeau, Libération, 23 January 2008, p. 34. Milad Doueihi quoted in Solé. The comparison with the Greek agora is Solé’s. Robert Darnton has addressed the topic of the transformation of libraries and books in the digital age in a series of articles in The New York Review of Books. See: “The New Age of the Book”, 18 March 1999; “The Great Book Massacre” [a review of Nicholson Baker’s Double Fold: Libraries and the Assault on Paper], 26 April 2001; “The Library in the New Age”, 12 June 2008. All are available online at www.nybooks.com. “Eric Gautier 1: avec Sean Penn”, comments recorded by Jean-Michel Frodon, Cahiers du Cinéma, No. 630 (January 2008), p. 25. Gautier added that for a project like Into the Wild, shooting on 35 mm film stock “remains unrivalled”. Available online at www.cahiersducinema.com. Previously, the Dardennes preferred to shoot exclusively on 16mm. For their new film, they did trial takes in both 16mm and 35mm and with five digital cameras, and ultimately preferred the look achieved with 35mm. It is worth noting that Penn’s film closes on a photograph of the real Christopher McCandless. See Dion Beebe’s detailed account of working on Miami Vice in Jay Holben, “Partners in Crimes”, American Cinematographer, August 2006, pp. 52-63. Mann was the Executive Producer of the television series. Cyril Neyrat, “Very High Definition”, Cahiers du Cinéma, No. 615 (September 2006). Available online at www.cahiersducinema.com; translated by Sally Shafto. Michael Mann quoted in the documentary Miami & Beyond, available as a bonus on the French DVD of Miami Vice. Michael Mann quoted in Brigitte Baudin’s review, “Michael Mann: sexe, suspense et solitude,” Le Figaro, 16 August 2006. Emmanuel Burdeau, “Jia Zhang-ke’s The World: News of the World”, Cahiers du Cinéma, No. 602 (June 2005). Available online at www.cahiersducinema.com; translated by Sally Shafto. Paul Benkimoun, “N’abusons pas des ondes” [“Let’s Not Misuse the Waves”], Le Monde, 19 December 2007, p. 29. Laura Pelé, “Angleterre, Allemagne, Autriche … le wif-fi interdit dans les écoles” [“England, Germany, Austria… Wi-Fi Banned in Schools”], Le Parisien, 9 February 2008, p. 3. The experiment was conducted at the University of Clermont-Ferrand. See Alexandre Ekhenazi, “L’éxpérience qui relance le doute” [“The Experiment that Raises Doubt”], Le Parisien, 9 February 2008, p. 2. On using a digital camera with non-actors in Ten, Kiarostami observed: “In Ten, their way of acting was so natural that even I was surprised. The digital camera made that possible, thanks to the freedom of action it permits.” Kiarostami quoted in Cahiers du Cinéma, September 2002, p. 13. See Rohmer’s interview: “J’ai voulu faire mieux que les Américains” [“I Wanted to Outdo the Americans”], Le Nouvel Observateur, 30 August 2001. Rohmer: “In analogical, there is a loss with each manipulation. With digital technology, you can interpose, theoretically, as many layers as you want.” Citation from: Cahiers du cinema, July-August 2001, p. 55. In the same interview, Rohmer, when asked if for him digital is simply a technical question, responds: “Yes. What is digital technology? It is simply a process that allows for no loss in reproduction. That’s what makes it interesting. It also allows for a greater control of colours. And there is also the well-known possibility of doing a ‘kinescopage’.” (p. 56). Noël Tinazzi, “Une chatte anglaise sur un trône brûlant” [“English Cat on a Burning Throne; pun on Cat on a Hot Tin Roof, which in French is: La Chatte sur un toit brûlant”], La Tribune, 7 September 2001. Citation from a transcribed interview included in the French DVD of L’Anglaise et le Duc. Taken from Rohmer’s remarks in the film, L’Anglaise et le Duc: un film révolutionnaire, vu par Françoise Etchegaray, included as a bonus on the French DVD of L’Anglais et le duc. See also Rohmer’s long interview with Cahiers du Cinéma: “Je voulais que la réalité devienne tableau” [“I Wanted Reality to Become a Painting”], Cahiers du Cinéma, No. 559 (July-August 2001), pp. 50-8. Article in France Soir, 11 September 2001. The next day, Le Figaro followed up with: “Faut-il guillotiner Rohmer” [“Should Rohmer be Guillotined?”], 12 September 2001. Comment “réinventer une terreur émancipatrice”, in Robespierre: Entre Vertu et terreur [“Robespierre: Between Virtue and Terror”]. See also Eric Aeschmann’s article, “Ces intellos qui rejettent la démocratie” [“Those intellectuals that Reject Democracy”], Libération, 16 February 2008. Le Point, 7 September 2001. Le Monde, 5 September 2001. See the remarks of Rohmer’s director of photography, “Entretien avec Diane Baratier: Attendre la bonne lumière” [“Waiting for the Right Light”], Positif, No. 559 (September 2007), p. 104. Rohmer shot L’Anglaise et le duc with a Betacam, a relatively heavy camera that was always on a tripod. In an interview with Les Inrockuptibles, he observed: “With me, the digital results in a stasis instead of mobility.” See Les Inrockuptibles, 4 September 2001. In an interview in Le Nouvel Observateur (August 30, 2001), Rohmer declared: “Digital technology is extremely interesting for optical effects, but, beyond that, I don’t know. The technique of cinema is very old; it hasn’t really evolved since Louis Lumière, other than the fact that cameras are now equipped with a motor. Will we keep film stock, or will everything be done henceforth on video, knowing that we are going to obtain more and more definition? If you ask me, there won’t be a miracle.” See also Rohmer’s comments on p. 56 of his interview with Cahiers du Cinéma, July-August 2001. Rohmer’s subsequent film, Triple Agent (2004), was shot in 35mm and his most recent film, Les Amours d’Astrée et de Céladon (2007), was shot on 16mm and transferred onto digital. Telephone conversation with Diane Baratier, Rohmer’s director of photography, 4 February 2008.